A 60s guitar prodigy who shaped Dylan’s sound and blew Clapton away, Bloomfield had the world at his feet. But he would never quite fulfil his promise. The crowd roars its approval as Bloomfield, 37 years old, ambles on stage in his bedroom slippers and starts ripping into the song in question. He stays for another, The Groom’s Still Waiting At The Altar, before leaving to deafening applause. It was to be the last gig of Mike Bloomfield’s life. Exactly three months later, on February 15, 1981, the man who Dylan cited as “the best guitar player I ever heard” was found dead in the front seat of his Chevrolet Impala. He’d succumbed to a drug overdose. Others, like Carlos Santana, Jorma Kaukonen and Jerry Garcia, saw him as the benchmark for expressionist guitar in the psychedelic era. Mike Bloomfield was always a rebel. Born into an affluent Jewish family on the North Side of Chicago, he turned his back on a career in the family business (his father Harold founded the restaurant supply empire Bloomfield Industries) and immersed himself in rock’n’roll. He received a transistor radio for his bar mitzvah and, soon after, a guitar. His earliest six-string heroes were Chuck Berry, Scotty Moore and Cliff Gallup, though the illicit pull of the blues soon captured his imagination. As a teenager he frequented the black clubs on the city’s South Side, hanging out at boozy sweatboxes like Silvio’s and Pepper’s Lounge, where he got to see blues icons up close: Muddy Waters, Howlin’ Wolf, Otis Spann, Junior Wells and Magic Sam. These were places where few white people ventured. But Bloomfield was one of a small coterie of young players, alongside Paul Butterfield, Charlie Musselwhite, Nick Gravenites and Elvin Bishop, who found their spiritual calling on the South Side. Buddy Guy was one of those they encountered. A deep thinker with a rapid-fire intellect, Bloomfield viewed blues as much more than a stylistic form. He devoured its folklore and soaked up influences like BB King, Albert King and Buddy Guy. But above all, the guitar was the conductor for his emotions, the intensity of his personality pouring through a flaming river of melodies and scales. By 1963 Bloomfield had met and befriended many great acoustic bluesmen he admired, among them Sleepy John Estes and Big Joe Williams. He’d book the latter at local coffeehouse the Fickle Pickle, where he started regular blues nights. At the same time, Bloomfield and Musselwhite’s band, The Group, were attracting attention. Columbia staff producer and scout John Hammond, father of Bloomfield’s friend of the same name and the man who signed Billie Holiday and Dylan, was quick to jump in. He invited Bloomfield to audition in New York early the next year, and duly snapped him up. Their common ground was blues. Both men deeply respected the other’s talents and appreciated the wider picture. Bloomfield later conceded it was the best group he’d played in. So much so that when Dylan offered him a place in his touring band he turned it down to stay with Butterfield. Fame and fortune meant little to Bloomfield, but devotion to the blues was everything. 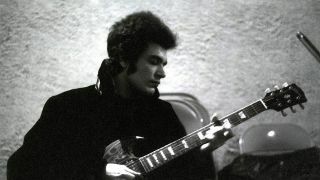 In the summer of 1965, Dylan invited Bloomfield to join sessions for his sixth studio album, Highway 61 Revisited, at CBS’s studios in Manhattan. Bloomfield’s first task was to figure what to bring to opening track Like A Rolling Stone. As well as the opening track, Bloomfield’s Telecaster runs added bite to feverish classics like Tombstone Blues and Desolation Row. He relied on instinct and exhaustive knowledge of style. “There was no concept,” he said. “No one knew what they wanted to play, no one knew what the music was supposed to sound like – other than Bob.” The results were spectacular, and Bloomfield backed Dylan at the Newport Folk Festival weeks later. That performance, in July 1965, was a watershed moment in Dylan’s career. Corralling the black Butterfield rhythm section in Jerome Arnold and Sam Lay, with Bloomfield on boisterous lead, he shocked folk purists by going electric. It was a stance the guitarist warmed to. “I would’ve plugged my guitar into Pete Seeger’s tuchus and put a fuzz tone on his peter,” Bloomfield quipped later. By September, Bloomfield was back in the studio with Butterfield, recording their debut album. The Paul Butterfield Blues Band was a voluminous blast that hipped the white college crowd to the electric roar of black America. Waspish covers of Willie Dixon, Muddy Waters and Elmore James jostled for space with Bloomfield originals like Screamin’ and Our Love Is Drifting. Their moment of glory arrived the following year. The band caused a stir at San Francisco’s Fillmore in March ’66, where they unleashed jazz-like improvisations such as Nat Adderley’s Work Song and an epic Bloomfield that wrote with Nick Gravenites, East-West. The latter, a raga-blues with piercing solos and free-form guitar, became the title track and centrepiece of their second album that August. In February ’67, Bloomfield quit the Butterfield Blues Band and moved to San Francisco. There he formed a new outfit, to reflect his love of American music and “prove that white boys have soul”, called the Electric Flag. With old friend Nick Gravenites sharing vocals with drummer Buddy Miles, Harvey Brooks on bass, pianist Barry Goldberg and robust horn section Marcus Doubleday and Peter Strazza, the band made their live debut at the Monterey Pop Festival. Their brew of brassy R&B and zestful blues was an instant success, even landing them an appearance in Peter Fonda/Roger Corman flick The Trip, for which they provided the soundtrack. But Bloomfield wasn’t satisfied. Personality clashes with Miles and widespread heroin use within the group destabilised things. The adrenalin rush of Monterey must have seemed a distant memory by the time the Electric Flag’s debut, A Long Time Comin’, lived up to its title by arriving in March ’68. Despite such prime guitar mastery as You Don’t Realise and a freak-blues extrapolation of Ron Polte’s Another Country, Bloomfield left by mutual consent come summer. The atmosphere surrounding the Electric Flag was just too divisive. “We never had time to mature as a band, dialectically, or even as people,” he bemoaned later. With one side of an album done, Kooper started ringing around for a replacement. (Stephen Stills came to the rescue.) Released in July ’68, Super Session was a hit, just shy of the Billboard Top 10, and went gold. Bloomfield reunited with Kooper a couple of months later for six shows at the Fillmore West (issued as The Live Adventures Of Mike Bloomfield And Al Kooper), though the guitarist again bailed halfway through due to insomnia. The box set From His Head To His Heart To His Hands is available via Sony Music.